The Kern River winds its way through the state of California for approximately 165 miles. It passes through the mountains, scenic canyons, and is one of the more popular camping destinations that our state has to offer. Wilderness hiking, white water rafting, and kayaking are just a few of the river’s main attractions. It holds the title of the only Sierra Nevada mountain range large river that drains to the South. As the entirety of the Kern River is accessible, there are numerous campsites suitable for RVs. The Kern offers fishermen the beauty of the natural surroundings, as well as a wealth of fish varieties. The river is a popular destination for fishing enthusiasts hoping to reel in some Largemouth Bass, Bluegill, Catfish, Crappie, Salmon, or Trout. Hiking terrain around the Kern Valley is brimming with trails. The trails have something to offer all ages and abilities from easy to extremely strenuous. All trails provide hikers with up close and personal views of the area’s bountiful natural resources. Kern nature trails like the Packsaddle trail and the Rincon trail offer endless wildflower and wildlife siting opportunities and range in distance from 4.6 miles to 39 miles. Many travel to the Kern River to partake in its water sports. 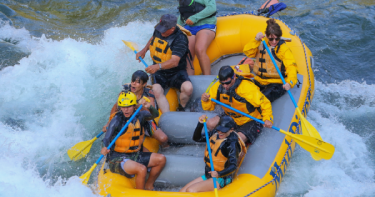 From fishing to white water rafting and kayaking, the accessible river offers excitement and the beauty of navigating the winding canyon and enjoying the views from the water. Spending some time along the river offers numerous wildlife-spotting opportunities. In addition to the wealth of fish and amphibian varieties you are likely to see in and along the river, be prepared for the potential to spot foxes, bears, coyotes, and many more. If you are thinking about camping in a Kern River RV rental, you are in luck. There are several campsites in the area with great amenities. Public and private campgrounds are available. The public campgrounds are run by the USDA/Reserve America. The public campgrounds vary in amenities like RV hookups, water, and showers. The private campgrounds are company-owned and most often offer more amenities than the public campgrounds. Private campground amenities include laundry, flush toilets, showers, complete RV hookups, and most feature a designated camp host to ensure the needs of all campers are being met. Just north of Kernville and extending to the Johnsondale Bridge are the Upper Kern river campgrounds. Also known as the ‘Limestone Put-in’, the majority of these campgrounds are public. Campgrounds along the lower river corridor are not as plentiful as along the Upper river corridor, but both are around 20 minutes from the rafting center so are ideal for those wanting to take in the Kern’s water sports. There are plenty of RV camping options along the Kern river from Camp James Campground, Lake Isabella RV Resort, Kern River Sequoia RV Resort, and Lake Isabella/Kern River KOA. These RV campgrounds offer full RV hookups, dump stations located throughout the grounds, large pull-in sites, most have free Wi-Fi, and many offer waterfront sites. From its wealth of RV-friendly campgrounds to water sports, fishing and wildlife opportunities, the Upper and Lower Kern offer its visitors a scenic backdrop for those special family memories.